Innoprise now provides inspectors with a mobile solution for accessing community development activities from the field, and is supported on the most popular mobile platforms including iOS (iPad, iPhone), Android and Windows Mobile. Innoprise Mobile Inspections dramatically enhances productivity by providing immediate access to information allowing inspectors to view daily inspections, future inspections and update inspection details from the field. Inspectors can take photos with their mobile device camera and upload directly into the Innoprise Community Development Suite. Our mobile application maintains a local cache of inspections on the mobile devices allowing use even when data service is unavailable. Inspectors can freely roam in and out of wireless service range and the mobile device will automatically synchronize when data service is available. The Innoprise Community Development software allows users to tailor the system using inspection results and canned comments. This functionality is also available in Mobile Inspections to streamline the entry of inspection comments by minimizing the need for typing. Inspection attributes that are defined within the Innoprise Community Development software is ported to the Mobile Inspections application. 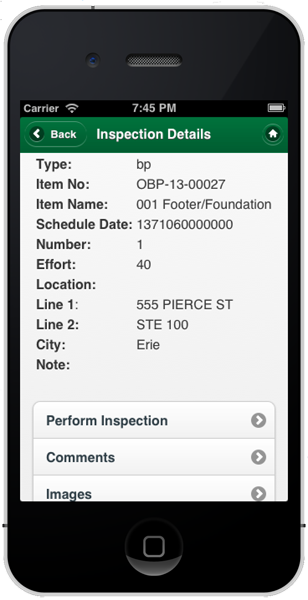 This feature provides inspectors with a "checklist" for resulting inspections through the mobile application.